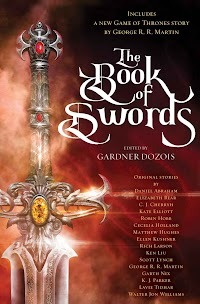 "The Hidden Girl," by Ken Liu [bio] (edited by Gardner Dozois), appeared in The Book of Swords (RSR review), published on October 10, 2017 by Bantam Books. Pro: The essence of the story is the moral choice the narrator makes when she realizes the governor is a good man. Does she act to please her teacher and her “sisters,” or does she forsake them and preserve the man in the belief that she’s serving the greater good? By the time she makes her choice, we like her, but we like her sisters as well, and we want her to retain their good regard, so we’re not sure which choice to root for. In the end, she’s at least got the respect of her sisters, even if they’re opponents now, so we’re sure she’s made the right choice. And we hope there will be more stories about her. Con: Her victory over her sisters is a little too easy. One wonders if she’ll be stuck here protecting this one man forever, since her teacher can just keep sending the other two girls—or even come herself.